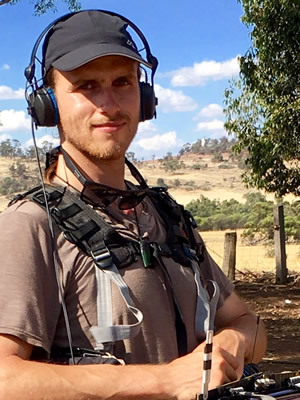 Richard Hubbard is a Location Audio Recordist and UAV Pilot (Drone Pilot) based in Perth, WA, but available to work Australia wide and internationally. Starting off from a technical background in a small studio in New Zealand, Richard has broadened his horizons as he’s moved further away from the motherland to find a niche that he loves. He’s worked with a large variety of genres including commercials, documentaries, short films and drama. His work has taken him far and wide but he has a special passion for remote location work. His credits include names such as Discovery, National Geographic, Channel 7, Fox Sports and numerous local production houses. Richard’s professional preference is to ‘own the process’. He believes success doesn’t happen by accident. Success requires a well-laid out plan and skills that have been practised. To have practised each action and to know its outcome before undertaking it in the field is to have owned that process. However, he also recognises the importance of being adaptive and responsive to unforeseen circumstances and has a well-established reputation as a ‘Mr. Fix-it’.